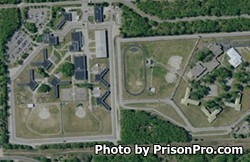 Muskegon Correctional Facility is a level II prison that can house 1,321 adult male inmates. It is located in the heavily wooded area of Muskegon Michigan. Inmates have religious worship and classes offered through the Chaplain's office, and can also participate in education courses that allow the offender to gain an adult basic education and earn a GED. Vocational activities offered at Muskegon Correctional Facility include food preparation and maintenance. Inmates can also receive substance abuse treatment and counseling. Muskegon Correctional Facility is secured by three fences covered in razor wire. In addition to fences, this prison utilizes security cameras, electronic motion detection systems, armed patrols, and has several armed guard towers to ensure no inmate escapes.